The State of New Jersey, colored red on the adjacent map, is bounded by New York on the northeast and by the Atlantic Ocean on the southeast. It is bordered by Pennsylvania to the northwest and by Delaware to the southwest. New Jersey is the 46th largest state in the United States, and its land area is 7,417 square miles (19,210 square kilometers). Comprised of 21 counties, New Jersey is one of the most densely populated states in the nation. The majority of its citizens live in urban areas and suburbs near New York City and Philadelphia. This New Jersey map site features road maps, topographical maps, and relief maps of New Jersey. The detailed, scrollable road map displays New Jersey counties, cities, and towns as well as Interstate, U.S., and New Jersey state highways. The pannable, scalable New Jersey street map can be zoomed in to show local streets and detailed imagery. to view a scalable New Jersey road map. The detailed New Jersey map and the regional New Jersey map display cities, roads, rivers, and lakes as well as terrain features. The detailed map shows only the State of New Jersey, while the regional map shows New Jersey and the surrounding region. New Jersey's capital city is Trenton. Other major New Jersey cities include Newark, Jersey City, Paterson, and Elizabeth in north Jersey as well as Toms River, Camden, and Atlantic City in south Jersey. In 2005, the population of New Jersey was estimated at 8,703,150, which is about 1,175.3 people per square mile. In 2010, New Jersey's population rose to 8,791,894 people. The state's Interstate Highways include primary routes I-78, I-80, and I-95 as well as auxiliary routes I-195, I-280, I-287, and I-295. New Jersey was named for the Isle of Jersey in the English Channel. Northern New Jersey's forested Skylands region encompasses the Kittatinny Mountains and features a good number of lakes. The fertile Piedmont lies to the southeast, blending into the pine and oak forests, cedar swamps, and marshlands which characterize southern New Jersey. The southeastern half of the state is coastal plain and its barrier islands draw vacationers every summer to enjoy the white sandy beaches. Principal landmarks include Morristown National Historic Park and the Edison National Historic Site. Popular recreational areas include the Delaware Water Gap and the Pinelands National Reserve. For New Jersey travel and tourism information, visit the official New Jersey tourism site and New Jersey Atlas. This New Jersey reference map shows major cities, roads, railroads, and physical features in New Jersey. 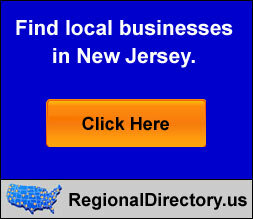 Several map publishing companies offer printed maps of New Jersey. For example, Omni Resources offers several maps of New Jersey that feature points of interest, airports, and parks, as well as selected local attractions and insets of major New Jersey cities. New-Jersey-Map.org Editor, State Maps, PO Box 775, Barnegat, NJ 08005.